THE TICHBORNE CLAIMANT Autograph Letter Signed. 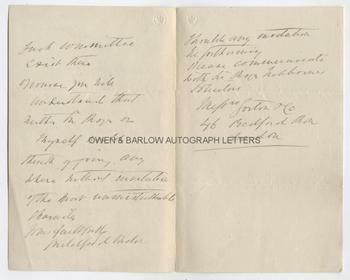 TOGETHER WITH an autograph letter signed by GUILDFORD ONSLOW the Claimant's supporter. Roger Charles Doughty Tichborne aka Arthur Orton aka Thomas Castro (known as "The Tichborne Claimant") and Guildford Onslow M.P., the claimant's staunchest advocate. ALS 2pp. No place. No date. To the Editor of the Daily Mail. 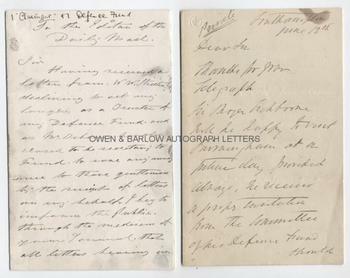 "Having received a letter from W.W. Streeter Esq declining to act any longer as a Trustee of my Defence Fund, and as Mr [. . .?] has also ceased to be secretary to Fund, to save any inconvenience to those gentlemen by the receipt of letters on my behalf, I beg to inform the public through the medium of your journal, that all letters bearing in any way upon my case should be addressed to Capt. Hunt's Office at the Tichborne Defence Fund, 37b Strand, W.C. Your obedient servant, R.C.D. Tichborne." 8vo. Approx 7.25 x 4.5 inches. Some inky fingerprints (probably either left by Tichborne himself or, more likely, the typesetter at the Daily Mail), mounting traces to right edge of last leaf, else near fine. TOGETHER WITH AN ALS 3pp. Southampton. June 12th, no year. To "Dear Sir." "Thanks for your telegraph. Sir Roger Tichborne will be happy to visit Birmingham at a future day provided always he receives a proper invitation from the Committee of his Defence Fund, should such committee exist there of course. You will understand that neither Sir Roger or myself would think of going anywhere without invitation of the most unmistakable [. . .?]. Yours faithfully, Guildford Onslow. Should any invitation be forthcoming please communicate with Sir Roger Tichborne's solicitors Messrs Foster & Co, 46 Bedford Row, London." The case of the Tichborne Claimant was one of the most reported and celebrated civil cases of the 19th century. The heir to the Tichborne baronetcy was presumed to have drowned in a shipwreck off the coast of Brazil in 1854. His grieving mother, believing him to be still alive, advertised widely in the press and in 1866 a butcher from Wagga Wagga, Australia came forward claiming to be the missing heir. He was brought to England and, although he appeared ill-educated and unrefined, Lady Tichborne immediately recognised him as her lost son. The majority of the family refused to do so, however, and when Lady Tichborne died, there began a long legal battle in which his identity was disputed. The case attracted huge media attention and reports filled the newspapers on an almost daily basis. The court eventually found that he was not Sir Roger Tichborne but was Arthur Orton, the son of a butcher from Wapping who, whilst in Australia, had gone under the name of Thomas Castro. After the loss of the civil case, Orton was prosecuted for perjury and fraud in what became one of the longest criminal trials in English legal history and was sentenced to 14 years imprisonment. After he was released on licence in 1884 Orton continued to pursue his claim but, by then, most of the public had lost their appetite for the case and his support had dwindled. Although there were sporadic attempts to revive the claim, Orton died destitute in 1898. Since his death, however, the evidence in the case has been examined many times and, although he is still regarded as one of the greatest fraudsters and imposters in history, there is now a growing body of support for the suggestion that he may have been, after all, the genuine Sir Roger Tichborne. It is reported that his funeral was attended by 5,000 people and the Tichborne family allowed his coffin to bear the inscription "Sir Roger Charles Doughty Tichborne". Guildford Onslow was an English Liberal M.P. who took up the case of the Tichborne Claimant and became Tichborne/Orton's most loyal and vocal supporter. 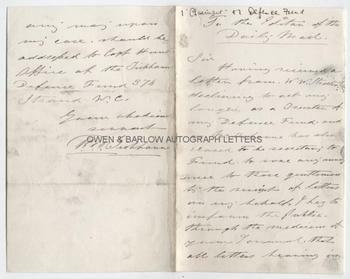 It was Onslow who provided sureties for Orton's bail from the Old Bailey and established a Defence Fund which allowed Orton to fight the case. Onslow himself was charged and convicted for contempt of court, following speeches he made in which he accused the Attorney-General and the Government of trying to pervert the course of justice.